Smoky Chipotle Turkey and Sweet Potato Chili; this uber easy and crazy flavorful chili recipe has both Instant Pot and stove top instructions! Confession: 90% of the chilis I make around here are vegetarian. I know, I know… so not the norm but so super delicious! Of course every once in a while I like to throw my t-rex husband a bone and make a big bowl of meaty chili for him. My kind gesture is usually followed up by my attempt to stuff as many veggies as humanly possible into the chili. I can’t help myself. Besides, mo’ veggies = mo’ flavor! This chili is packed with the perfect protein to veggie ratio with a kick of chipotle for good measure! 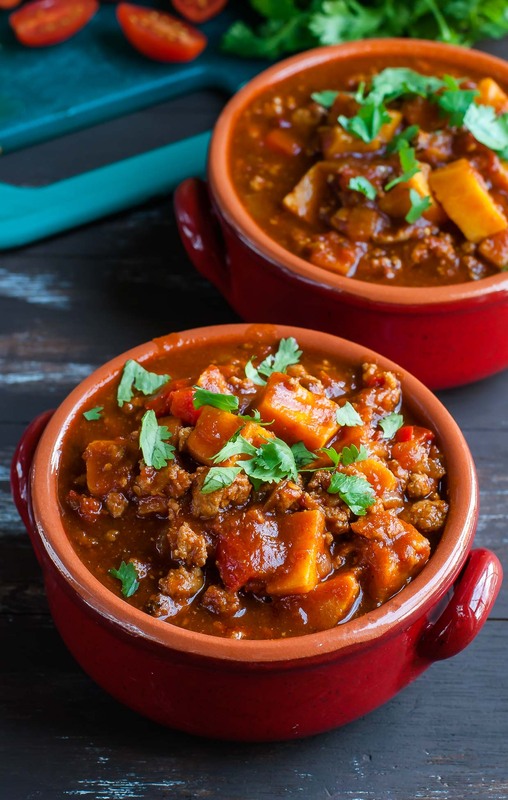 This tasty turkey chili is deliciously smoky and a teeny bit spicy with layer of savory sweetness in every bite from the red bell peppers and sweet potatoes. 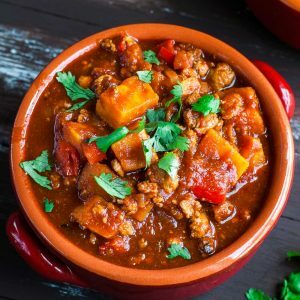 I’ve made sweet potato chili before but this one totally takes the cake! It is hands-down the best turkey chili I’ve ever had! I think it’s the kiss of chipotle pepper that really sets this bowl-o-comfort apart. The smoky chipotle flavor pairs great with turkey, fabulous with sweet potato, and when you simmer it all together in a big pot of saucy veggies pure magic happens. I know I’m being totally dramatic here but I straight up LOVE this chili! I fully plan on doubling the ingredients next time so I have lots of tasty leftovers to scarf. Looking for something to pair with your chili? Try my Quick and Easy Homemade Cornbread or squeeze in some extra veggies with this Healthy Tomato Cucumber Avocado Salad. 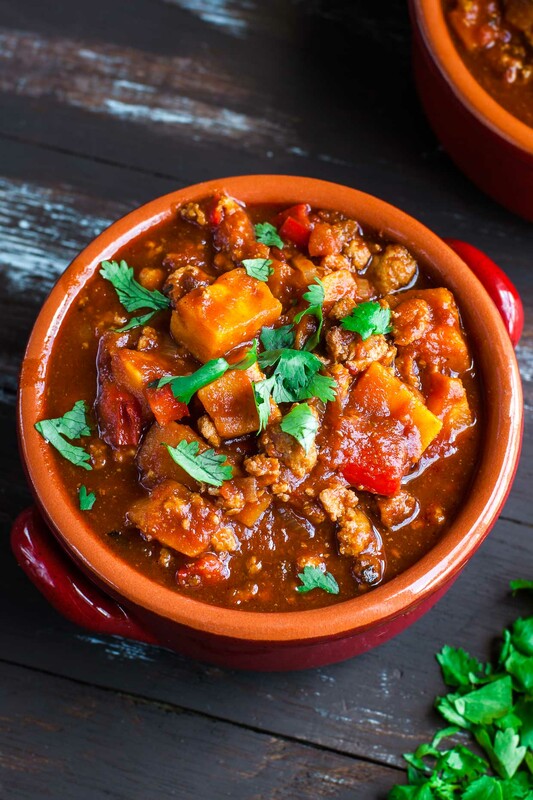 If you get a chance to try this Smoky Chipotle Turkey and Sweet Potato Chili let me know! Looking for a VEGAN or VEGETARIAN chili? No worries! Try my Vegan Lentil Chili and/or Healthy Vegetarian Quinoa Chili and prepare to swoon! NO TURKEY? No problem! This chili can also be made with ground beef. Ready to pile on the toppings? Customize your bowl with all your favorites. My go-to toppings are usually cheddar, jalapeño, sour cream, and fresh cilantro with a hunk of fluffy warm cornbread on the side. YUM! Making this PALEO or for WHOLE30? As long as your toppings follow suit you’re good to go! Try cilantro, jalapeños, and extra red bell pepper or even some fresh avocado and red onion too! Brown turkey until medium rare, then add shallots and bell pepper. Cook until softened, approx. 2-3 min. Add tomato paste, chopped/ minced chipotle pepper in adobo, and spices. Mix well and cook for an additional minute. Next stir in your sweet potato, crushed tomatoes, tomato sauce, and veggie broth. Cook until sweet potato is fork-tender and the chili has thickened, approx. 25 minutes. This is a must try in my new instant pot! Yay!!! Hope it’s a hit! Ever tried black beans in this? How do you think they would go? This is a fabulous recipe! It is my favorite chili recipe! This was very delicious!!! I will make it again! So thrilled you enjoyed it Teri, thank you!! Hey Donna! I haven’t tried yet with this one but all the other chili recipes I’ve made froze beautifully so I’d venture to say yes! Thank you, I making this for a dairy free family, think they will really like this! So excited to hear it Donna, I hope it’s a big hit! We’re totally in love with this turkey chili recipe! In step 7 Switch IP off, then set to HIGH for 9 minutes with lid and vent sealed. Set on High for 9 minutes on Manual? Or another option (Stew, etc)? Thanks! Love this chili. Was a bit worried about the sweet potato but it actually goes very well with it. Plenty spicy. Made a few changes to my batch with ground beef and beef broth also added an entire can of crushed tomato and tomato sauce and just cooked it longer to thicken it up and drive off the liquid. Very good recipe. Thank you! Has anyone calculated calories for this recipe? Hi Diana! You can plug in the measurements and type of meat (lean/regular/etc – turkey or beef) you end up using for the recipe into myfitnesspal.com and get a pretty great nutrition sheet with all the details — many of my friends use and love the calculator a lot! Have made this twice in the last week while on Whole30. It is SO delicious and will be added to my regular recipe routine! Added a few more chipotle peppers in adobo to use up the can and it was perfectly spicy. Thank you! I have never tried ground meat in my pressure cooker before. This turned out very well. Thanks! This was delicious! I made it in my Instant Pot which I’ve only recently purchased and have been trying a variety of different recipes. At first I thought where are the beans, but the sweet potatoes are so nice! Don’t judge me but…I just ate leftover Smoky Chipotle Turkey and Sweet Potato Chili for breakfast and it was just as tasty, maybe even more! Wow! This is delicious!! Can’t wait to try more of your recipes. FEED ME ALL OF THIS DELICIOUSNESS! Seriously, this looks incredible- love the twist on your typical chili recipe! Need to try! If I double the recipe, how should I adjust the cooking time?? Recipe looks amazing and I’m looking forward to making it. A couple of questions. Step 4 of the instant pot directions says add garlic but garlic is not listed as an ingredient. How much garlic? Also chipotle and sweet potatoes are listed in ingredients but the directions never say when to add them. Thanks! Thank you so much Carol! I don’t know how I had the instructions all there in the stove-top version and then spaced out, astronaut style, when I was drafting up the IP version. Thanks so so much for letting me know — everything is completely sorted out now! You’ll add the SP and chipotle along with all the spices, no garlic for this batch (though I do use it for my vegan and vegetarian chilis) but feel free to sauté a clove if you’re a big fan of garlic in your chili! Such a comforting dish! I can’t wait to try it! What more could you want? Cooking options, simple, a little heat and veggies all in one is my kind of recipe! Sounds delicious! I’m having a problem getting my spoon through the screen. Should I reboot? This looks absolutely incredible! Thanks Lisa! Love how customizable all the toppings are – no two chilis have to be alike! I absolutely love sweet potato right now. Tastes nice, it’s good for you and it fills you up! I love the idea of smoky chipotle with the turkey. We’re loving it too! It tastes great with so many flavor profiles – such a great option! 🙂 Thanks Deano! This looks amazing!!! I’m hoping to expand my repertoire of recipes and I’m definitely giving this a try. Miss you and that precious, curly head girl of yours. Hope you’re having the best summer!! Ahhhh Amy we miss you so so much! Mia plays school at least once a week and talks about you and Angela nonstop! Summer is fun but we’re also so excited for August too!